After a lot of sketching and scratching my head, I have come up with a new symbol for myself and the website. It is a multi-quadrant circle. Each quadrant symbolizes something about myself and the work I do. 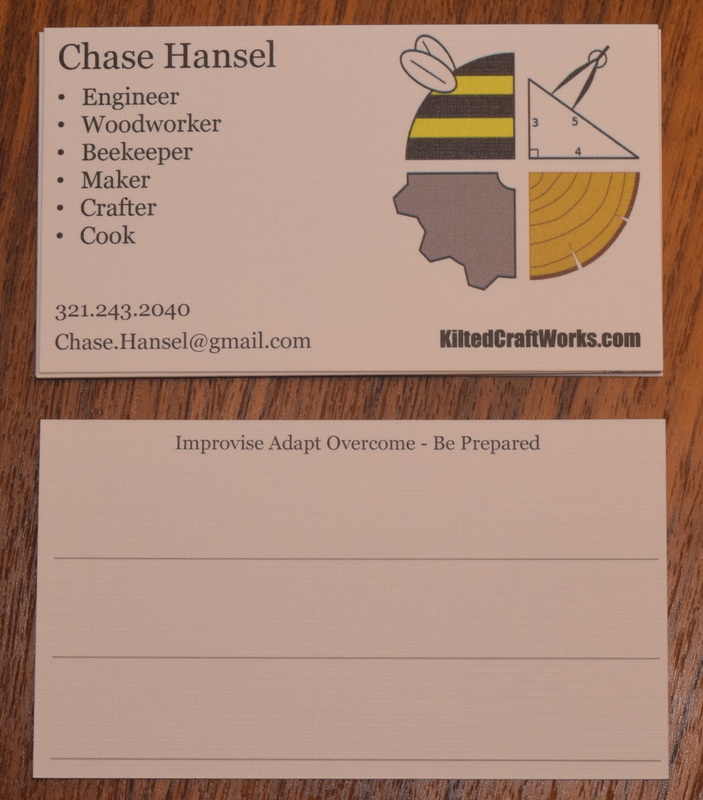 The top left is for my beekeeping and running of the local Space Coast Beekeepers. The bottom left is part of a gear and symbolizes my background in mechanical engineering, and the invention work I do. The bottom right is my attempt at a log segment for all my woodworking adventures. The top right is kind of a mixed bag. It is a divider laying out a 3-4-5 triangle. It involves mathematics and measurement, which are at the core of a lot of what I do professionally and in my hobbies. A 3-4-5 triangle is relatively easy to make if you have anything like a divider to set as a starting unit. The initial length is arbitrary, but once picked if you make segments of the prescribed lengths, you can form a right angle of any size. I like working to the thousandth of an inch on my CNC mill, and with ratios and body part lengths in my woodworking. My art skills are pretty poor, so I went with a vector graphic program what would provide cartoony results that look good small or large. They also look good on a business card. It has my symbol, basic contact information, and a small list of things I do. The back has two of my favorite sayings that really describe how I operate. It also has 3 lines to help aid in writing notes. Business cards are super useful things to have on hand. Beyond basic contact information you often need to give someone other information. Websites, product info, funny youtube videos to watch, you know the stuff! My field notes always have the last 10 pages ripped out to pass off information to people. It would be nice if everyone carried a pen and paper with them. Carrying the cards around every day is the obvious goal, but the corners get bent up in my wallet over time. I want to turn the back cover of my field notes into a business card holder. I started by wrapping up a small stack of cards in packing tape to prevent glue sticking. Card stock got folded up into a kind of pouch, and all overlapping areas were trimmed. I glued all the tabs down to the back my field notes with the cards inside to help keep the shape right. Wax paper keeps the glue from bonding the last page down to the inner cover. 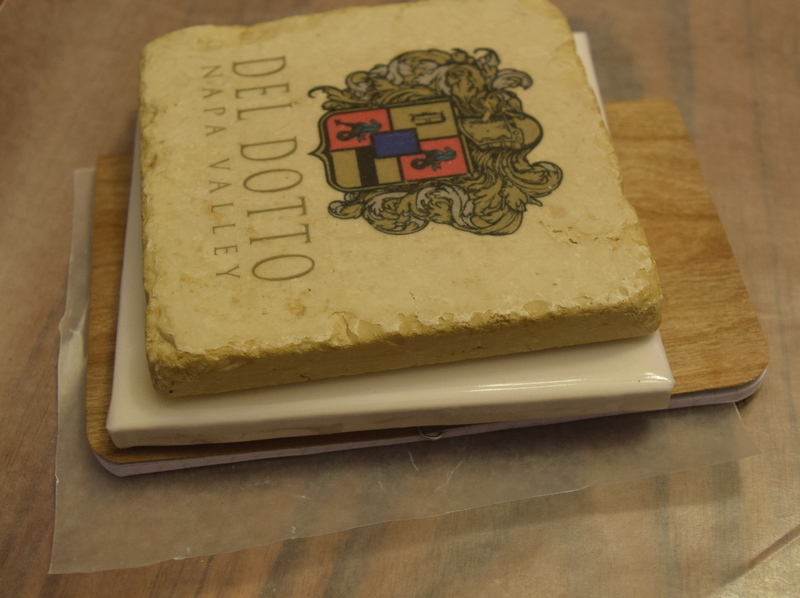 Stone coasters make handy clamps. I cut a notch in the center of the holder so that fishing them out would be easier. 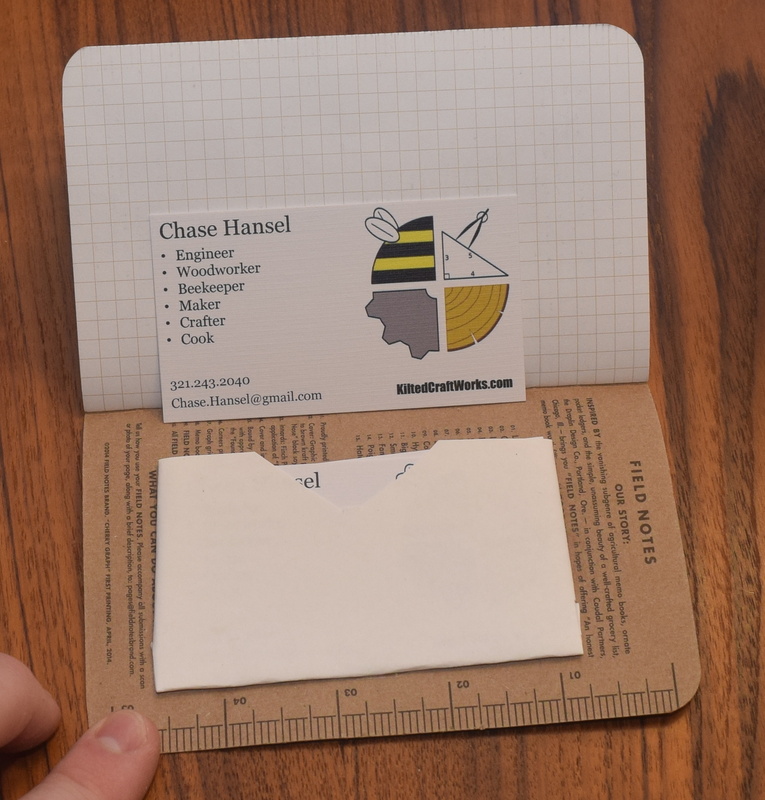 The card stock and business cards make a small bulge that could interfere with writing on the last few pages. Time will tell. This entry was posted in Uncategorized and tagged Business Card, Symbol by Chase. Bookmark the permalink.